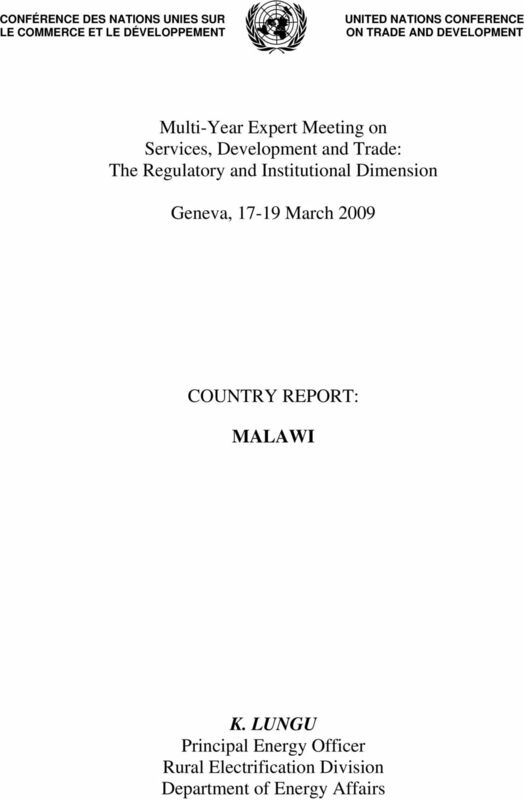 Download "Geneva, 17-19 March 2009 COUNTRY REPORT: MALAWI"
3 Introduction Malawi s energy supply sector has five key components: electricity, liquid fuels and gas, coal, biomass and other renewable sources of energy. There is a sizeable deposit of uranium in northern part of Malawi. The process of mining this uranium is underway for purpose of exporting and not for development of nuclear power. Malawi s ESI generates electricity by hydro, thermal (largely diesel and gas based) and photovoltaic (PV) systems. Hydropower generation is the largest source, PVs are used in modular form for telecommunications, lighting and water pumping in rural areas where there is no grid power. A significant number of commercial and industrial enterprises have installed their own diesel and petrol driven generators. There is no wind turbine generation because the winds are inadequate for large-scale power generation. Some wind power is used for pumping water. Electricity The commercial Electricity Supply Industry is dominated by a publicly owned and vertically integrated power utility, the Electricity Supply Corporation of Malawi (ESCOM) Ltd., established by an Act of Parliament. in 1957 (revised 1963 and 1998). Total ESCOM s installed capacity is estimated at 304 MW. Of this, approximately 285MW (94%) is generated by hydropower and the remaining 19MW (6%) is thermal. Except for a small mini-hydro plant on Wovwe River (4.5MW), all ESCOM s generation capacity is located along the Shire River (about four power stations), the main natural outlet for Lake Malawi. Power transmission is principally through the 132kV and 66kV network and power distribution is at 33kV, 11kV and 400/230V. Liquid Fuels and Gas Malawi has no refinery for petroleum products hence imports 97% of its refined petroleum products, the balance is contributed by locally-produced ethanol, sold directly to the oil companies for blending with petrol on a maximum 10:90 ratio of ethanol-petrol. This ratio is not being met (it is usually 12:88) because production is limited and because of the lack of legislation to make the blend mandatory. If ethanol production ran at its current full capacity, it could produce 18 million litres, nearly 7% of the total liquid fuels market. Coal Supply Industry Malawi has 1 billion metric tonnes of probable coal reserves, of which 22 million tonnes are proven reserves of a bituminous type. These resources occur in various parts of the country. Although coal deposits occur at these several locations, coal mining started only in By 2000 annual production was approximately 55,000 tonnes, meeting only for 20% of the country s total requirements. The remaining 80% is imported. 4 Biomass Supply Industry Malawi s energy balance is dominated by biomass (firewood, charcoal, agricultural and industrial wastes), which account for 97% of the total primary energy supply. Statistics have shown that more than a third (34%) of biomass resources are obtained from agricultural and industrial residues. Although the use of residues for energy has a large opportunity cost for agriculture, its impact on deforestation is virtually non-existent. The energy sector s contribution to deforestation is mainly related to the wood obtained from unsustainable sources on customary lands for charcoal production and firewood. Other Renewable Energy Sources Supply Industry Malawi is well endowed with other renewable energy sources (ORES) including good sunshine throughout the year for photo-voltaic and photo-thermal applications, reasonable wind speeds for water pumping, a number of perennial rivers with hydro power potential, a reasonably large population of domesticated animals for biogas applications and hot springs for geothermal power generation. Although technologies for ORES conversions are now widely commercially available and their prices are increasingly competitive, Malawi has not been able to fully utilize them. As a consequence, the role of ORES in the total energy balance has remained insignificant (0.2%). This is attributed to the prevalence of a number of technical, economic, skills, institutional and socio-cultural barriers. Energy Infrastructure Services The type and level of energy infrastructure in a particular country depends on the type and source of energy utilized. Some energy sources require infrastructure development while others do not. 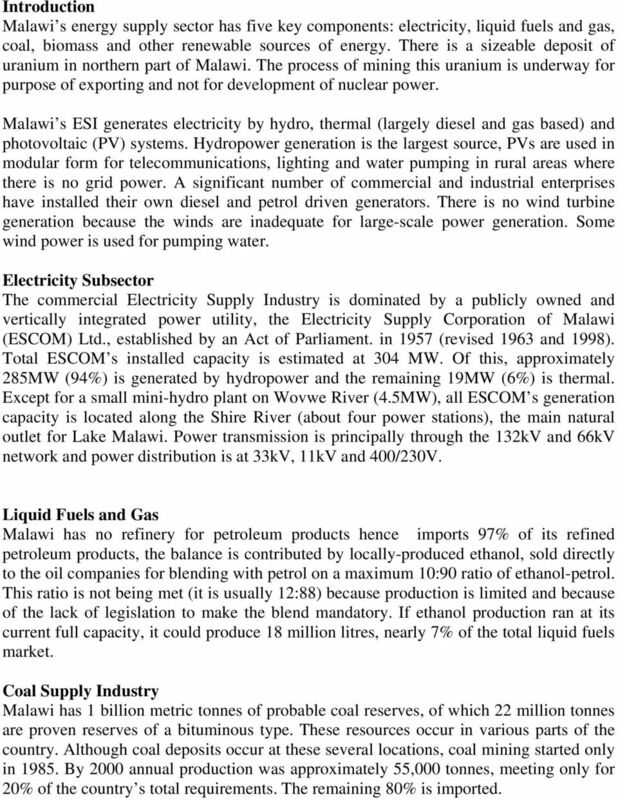 Considering the case of Malawi as described above the energy infrastructure includes; generation, transmission, and distribution facilities in the electricity sector; and storage and reservoir facilities for Liquid Fuels and Gas. The established infrastructures then need to be regulated through an institutional framework. 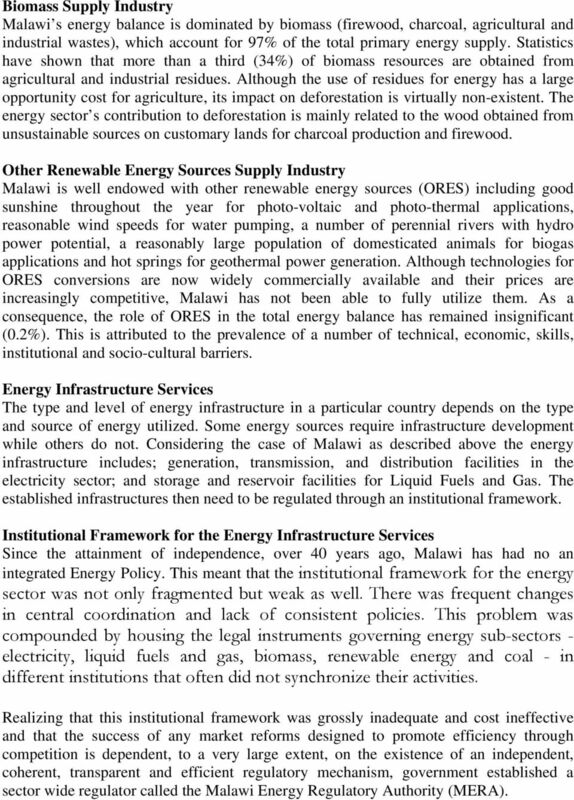 Institutional Framework for the Energy Infrastructure Services Since the attainment of independence, over 40 years ago, Malawi has had no an integrated Energy Policy. This meant that the institutional framework for the energy sector was not only fragmented but weak as well. There was frequent changes in central coordination and lack of consistent policies. This problem was compounded by housing the legal instruments governing energy sub-sectors - electricity, liquid fuels and gas, biomass, renewable energy and coal - in different institutions that often did not synchronize their activities. Realizing that this institutional framework was grossly inadequate and cost ineffective and that the success of any market reforms designed to promote efficiency through competition is dependent, to a very large extent, on the existence of an independent, coherent, transparent and efficient regulatory mechanism, government established a sector wide regulator called the Malawi Energy Regulatory Authority (MERA). 5 MERA regulates all the energy players (production and supply) in the country in collaboration with the Department of Energy and both entities reports to the Ministry of Energy and Mines. Below is the schematic structure of the Institutional Framework. 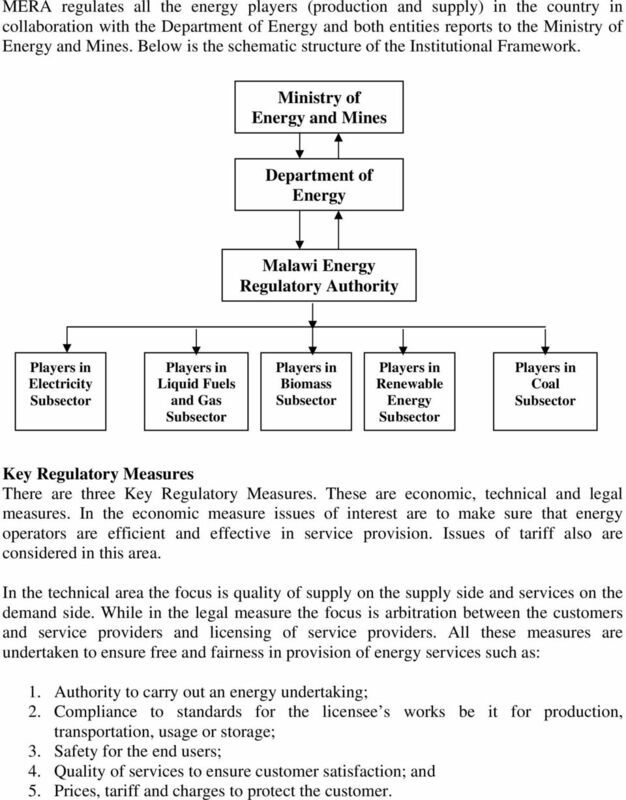 Ministry of Energy and Mines Department of Energy Malawi Energy Regulatory Authority Electricity Liquid Fuels and Gas Biomass Renewable Energy Coal Key Regulatory Measures There are three Key Regulatory Measures. These are economic, technical and legal measures. In the economic measure issues of interest are to make sure that energy operators are efficient and effective in service provision. Issues of tariff also are considered in this area. In the technical area the focus is quality of supply on the supply side and services on the demand side. While in the legal measure the focus is arbitration between the customers and service providers and licensing of service providers. All these measures are undertaken to ensure free and fairness in provision of energy services such as: 1. Authority to carry out an energy undertaking; 2. Compliance to standards for the licensee s works be it for production, transportation, usage or storage; 3. Safety for the end users; 4. Quality of services to ensure customer satisfaction; and 5. Prices, tariff and charges to protect the customer. 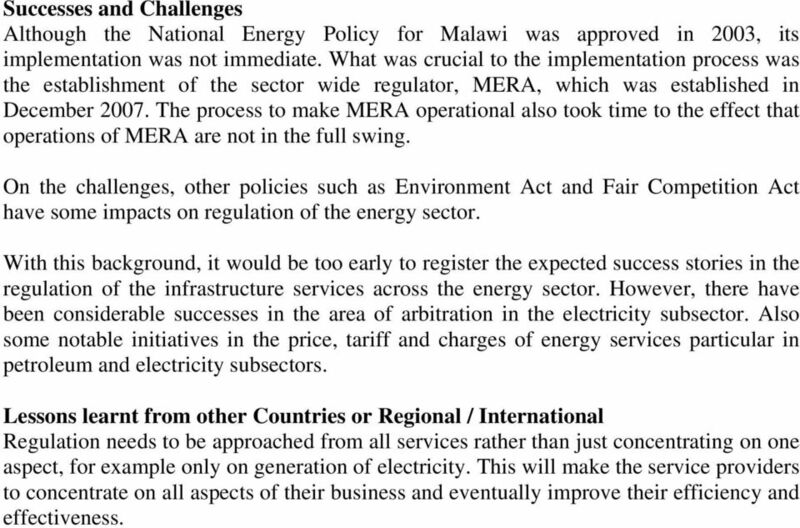 6 Successes and Challenges Although the National Energy Policy for Malawi was approved in 2003, its implementation was not immediate. What was crucial to the implementation process was the establishment of the sector wide regulator, MERA, which was established in December The process to make MERA operational also took time to the effect that operations of MERA are not in the full swing. On the challenges, other policies such as Environment Act and Fair Competition Act have some impacts on regulation of the energy sector. With this background, it would be too early to register the expected success stories in the regulation of the infrastructure services across the energy sector. However, there have been considerable successes in the area of arbitration in the electricity subsector. Also some notable initiatives in the price, tariff and charges of energy services particular in petroleum and electricity subsectors. Lessons learnt from other Countries or Regional / International Regulation needs to be approached from all services rather than just concentrating on one aspect, for example only on generation of electricity. This will make the service providers to concentrate on all aspects of their business and eventually improve their efficiency and effectiveness. Germany's energy transition: Status quo and Challenges. Issue 3. Should we use more renewable energy as electricity source. in Hong Kong? Renewable Energy Development in Thailand Karnnalin Theerarattananoon, Ph.D. EXERCISE 1: OVERVIEW OF RENEWABLE ENERGY ANSWERS 1. In pipe hydropower The Californian city of Fontini obtains half of its drinking water from a reservoir in the hills above the city and half from groundwater. Germany's renewable energy sector in the context of energy transition.